Blurb Description: Every year, Blue Sargent stands next to her clairvoyant mother as the soon-to-be dead walk past. Blue herself never sees them—not until this year, when a boy emerges from the dark and speaks directly to her. His name is Gansey, and Blue soon discovers that he is a rich student at Aglionby, the local private school. Blue has a policy of staying away from Aglionby boys. Known as Raven Boys, they can only mean trouble. 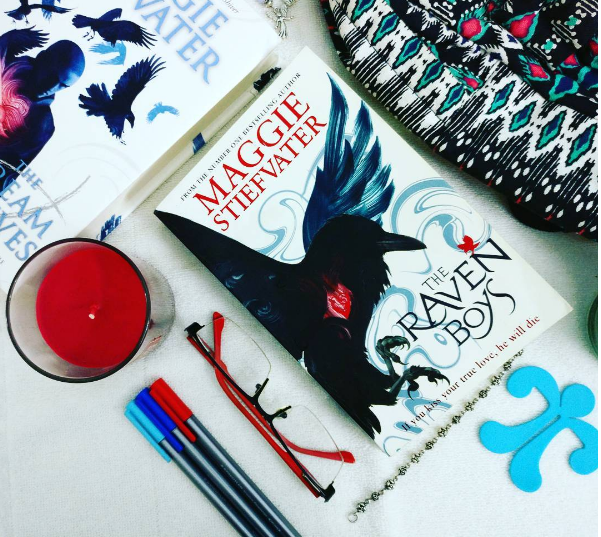 This is my re-read of The Raven Boys, because I FINALLY got the opportunity from the lovely folks over at Scholastic India, to read the rest of the series, and it is SO MUCH BETTER than I remember it being! I initially read The Raven Boys two-three years ago, and I simply didn’t fully appreciate the eccentricities and personalities of each and every character in the book. All four boys, Blue, and Blue’s family are SO WELL DEVELOPED it’s hard to imagine them as anything less than real, sentient beings over fictional characters. This is probably because, this time round, I actually paid attention to the details and all of the MAGIC in the air around the Raven Boys instead of simply sitting around and wondering if Gansey was Blue’s True Love, and how he would somehow survive to give them the fairy tale happy ending. 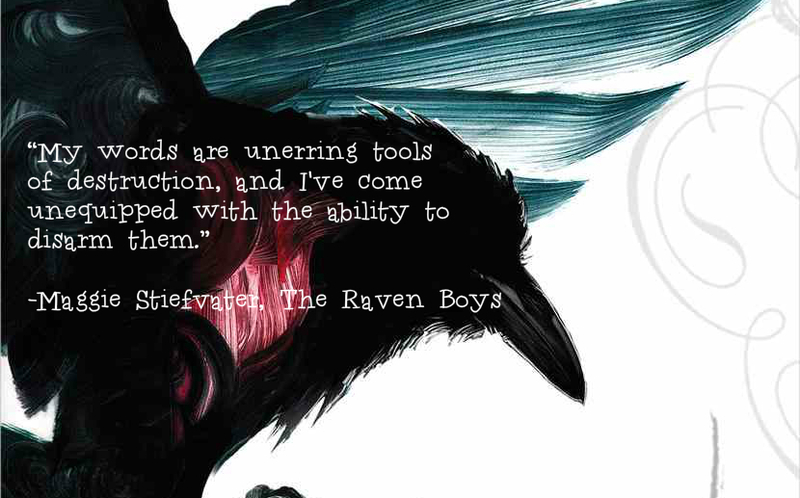 But first, what is The Raven Boys all about? Blue Sargent has been told, since the day she was born, that is she kisses her true love, she will kill him. A non-psychic in a family filled to the brim with them, Blue is on the search for irrefutable proof that the magic that has eluded her all her life is indeed, real. Gansey, Adam, Noah and Ronan are four boys – four troublesome broken Raven Boys – on a mission. They’re not just regular rich private school brats, but seek to wake up an energy filled line – a ley line – and find the ancient Welsh King Glendower, who has been buried on the line, who legend says will bestow a favour on the one who wakes him. As they boys bring Blue into the fold, none of them can deny the sensation that something bigger than them is starting, and that they’re in the centre of it all. Truth be told, I have fallen ABSOLUTELY IN LOVE with this realistic, magic filled book! 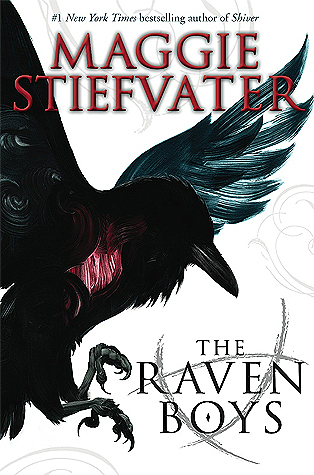 I loved the problems that each of the Raven Boys faced internally – their shortcomings and their flaws – and how despite all their differences they managed to fit together like pieces in a puzzle. I loved the undercurrent of magic that followed every word and every scene in this book – I could tell that there was so much more going on than Blue and her Raven Boys knew at the moment – and I am so excited to learn about it all. Maggie Stiefvater’s writing is subtle, elegant and shows the depths of her imagination, and The Raven Boys is an ingenious book with the power to make magic feel real. I will currently cut short my ramblings and run away to read The Dream Thieves.